For generations, students have been expected to absorb huge amounts of information, sometimes by simply being lectured to. And while the variety of activities we see now in class has greatly increased and become more student-centered, we are still often lacking tangible artifacts of learning that students take away from class. Making classes more engaging and interactive should be an essential part of the education process. The act of creation in schools is often rather limited. Very few schools teach students how to produce something entirely new with what they have learned in class. Students are often just passive consumers rather than active creators. 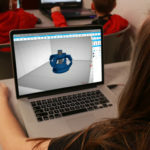 3D – whether we are talking about 3D printing, 3D modeling software, etc – can provide numerous benefits to both teachers and students. For teachers, using the 3D technologies can help seize students’ interest in new class subjects. It provides hands-on experience which makes it a great tool when trying to explain difficult concepts or structures. For students, it’s an exercise of imagination as well as a great way to test the feasibility of their ideas – for example, they can create designs and then test them before their presentations. And the great thing about 3D is that it can be integrated in almost any class, be it architecture, geography, arts, design, maths, history or science. The possibilities are really limitless. With 3D printers getting more affordable each year, it is becoming more common thing for any school to own one or more of them. 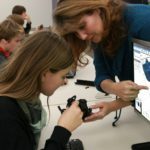 These schools need 3D design tools that are accessible and powerful enough to help their students conceptualize and 3D model designs for their projects. Vectary is a free, online 3D content creation and modeling tool very easy to use even for those new to 3D design. Its simple, intuitive interface, along with a large online library of 3D models and templates can help users quickly get the hang of it. What makes this design tool particularly great for schools is that it requires no license management and no install since it runs in the web browser. There’s no need for powerful, expensive computers – it runs even on Chromebooks, which says a lot of its potential in class. Being online also means that teachers and students can work on their projects from anywhere as long as there is an internet connection. Sharing projects as live 3D links instead of locally stored files makes it a lot easier to manage virtual classrooms and collaborate in real time. Colin Pattison, a science teacher from Ontario, Canada made Vectary a key component of his classroom and used it to create and then 3D print working models of functional skipping ropes. He is also planning to teach his students how to design, print and sell their 3D models as holiday or class fundraisers. This makes them aware and familiar with the whole product life cycle – from concept to actual marketing and selling – a valuable experience about how things work in real life. Other teachers, like David Carter from the Milpitas High School in the San Francisco Bay Area, use the 3D modeling software to help better explain their lessons to students. He came up with a catchy idea to make his geography class both fun and practical by teaching his 9th grade students to CAD and 3D print their “adopted” volcanoes. “Vectary can do everything I need from Blender. It eliminates the need for Tinkercad, which is of course only an object manipulator, not the full-fledged 3D editor Vectary is. Plus, it is indeed easier to use than Blender, and runs on a Chromebook quite well. It allows the import of .svg, as well as smoothing and repairing of imported 3D models. Sometimes, the younger the students, the easier it is to advance new ideas and programs. Danielle Lane from Lyttelton Primary School in Lyttelton, New Zealand decided to pick up 3D modeling and printing as a school project for a group of students. Self taught in 3D modeling herself, she was learning alongside her students by going through the Vectary 3D tutorials. Together they created a series of keychains to be sold at the school market day, making it a great way to show students the true value of their work. Yet, above all, 3D modeling should always be about fun design, experimenting with different shapes or coming up with original solutions, all to encourage creativity. Kai Holmes, a high school teacher from Bristol, UK is an an early adopter of desktop 3D printing in the classroom. He teaches product design to students aged 13 to 19 and is trying to integrate what he has learned about 3D printing and CAD into his new school’s product design department. One of his projects – the “Egg Cup” – turned out to be quite popular among his students who had to design a children’s egg cup with a specific theme. The results were very creative, with students making egg cups in all sorts of shapes. It is clear that if schools want to remain relevant, 3D will be an important, if not essential component that they will have to integrate. With new innovative, online 3D software that are built to shorten the learning curve as much as possible, it is getting easier and easier to achieve competency in 3D. The technology is evolving at a rapid pace and it will be up to those who use it to reap the greatest benefits. 3D modeling can be lots of fun and easy to teach and learn. To make it more adaptable to classes, we started a new program — VECTARY for Education — and many workshop leaders and teachers who have joined are standing by it. Be one of them and start utilizing fully our free 3D resources today! Next articleYou Need to be Available to Meet With Your Students. How can Technology Help? 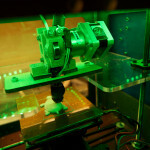 From beginning to now you have noticed huge growth in the printing feature of the 3D printer. In every industry, it is used for the different purposes. If you have good skill of modeling you can have a better result. So better to learn to model if you want to have a good result from the 3D printer. 3d printers can transform lessons and learn with 3d model. This 3d model can help to understand to a next level. The 3d printer can build everything in the future. And it is also a revolution in the learning world.